March means the promise of warmer weather, blooming flowers and Spring Break! My mom wanted to throw a little party for the teachers at her school to celebrate their upcoming week of freedom. She sent me an email told me what she had in mind, told me she was doing it in 1 week and then asked if I was in. Of course! 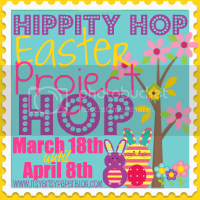 I put out a call on Facebook for inspiration or cute spring packages and Miranda with Whimsical Printables said she would love to design something for me. I was thrilled with her suggestion and even more excited she didn’t bat an eye when I told her I needed it in 3 days! I set up a small area to brighten up the teachers lounge and display some of the goodies the teachers had brought. Bright colored lanterns and the darling ‘Spring Fling’ banner framed the elevated shelf that I covered with patches of grass. I bought unfinished birdhouses and birds for $1 at Michael’s and painted them to match the printables. I found the cute grass shaped wooden boxes at Hobby Lobby and they were perfect to display my appetizer forks. Sprinkle in some candy, sweet cupcakes and lots of munchies and you’ve got the perfect ingredients for a fabulous Spring Day! Unfortunately, the lighting was horrible and the pictures don’t do this bright and cheery Spring Fling party justice. But, it was such a fun party and it only cost me $20! So cheery and bright! Love the appetizer forks! Amazing… I would love to do this for our teacher in-service a week from Monday… Or even just the cupcakes, water, banner, and roll ups. I will ask the principal if it's ok! You rock! I know the teachers were blown away! I love this! It is so bright and cheery. Love your party! Would you mind sharing how you propped up the forks with the wraps..that is the cutest presentation!! Hi Ashley, I used fake grass squares from Hobby Lobby for the top shelf with the white platters. Sixnia I found the appetizer forks at Hobby Lobby and they have a small stand that comes with it. I just placed them in the grass boxes for a little extra detail.